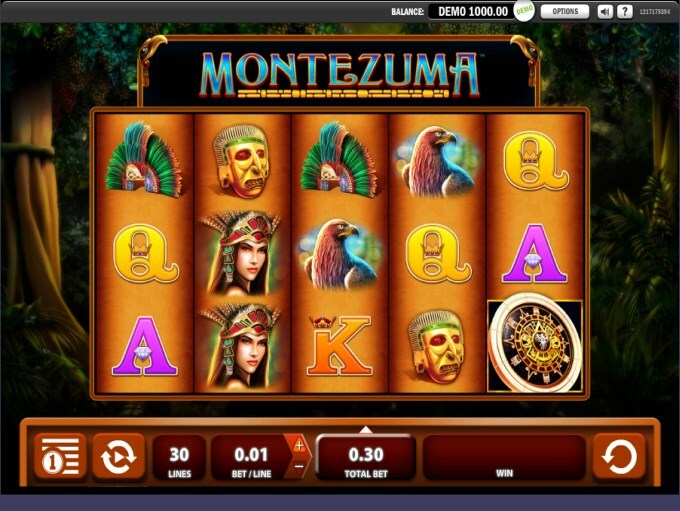 Montezuma is a slot machine from WMS, which is themed around the Aztec Empire and around one of its better known rulers, Montezuma II. While he wasn’t the only ruler of the Aztecs with this name, he is the one most people refer to, since the first time that Europeans had contact with the natives of South America it happened while Montezuma was the ruler. He was eventually killed by Hernan Cortes, a Conquistador that was escaping at the time from Tehnochtitlan, the capital of the Aztecs. 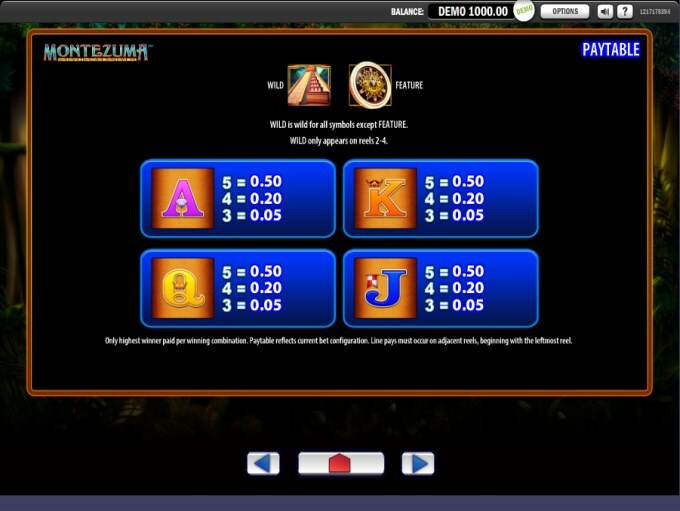 Montezuma’s layout of 5 reels has up to 30 paylines on them. 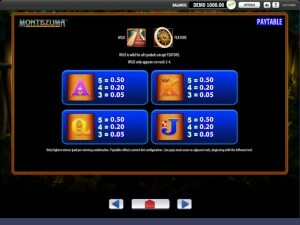 It’s a game with free spins, 10x multipliers, scatter symbols and wilds. As for the big prize, it’s actually rather small, worth only $600. 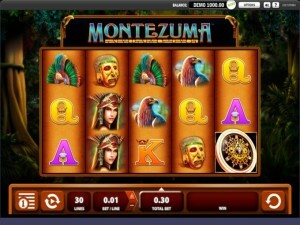 The best features present in Montezuma are the ones that other slots also offer, but that doesn’t make them any less appealing. You have wild symbols inside, along with scatters, with free spins and some high multipliers, going even up to 10x. You’re not going to get the top jackpot when the wild appears on all the reels it is allowed on, the reason being that only four reels can get this particular feature. Those reels are the ones that go from the 2nd to the 5th. A wild can still be incredibly useful, but certain requirements have to be met first, the symbol needing to appear on a payline which has the rest of the symbols for a combo already. The wild simply substitutes for the missing one, and only if it is needed in the spot where the wild landed. The chosen image for the wild is that of a Temple in the shape of a pyramid. We have the other symbol with an important role in Montezuma in the scatter. Having at least three scatters present will do two things for you. It will give you a prize which is valued between 3x and 10x the total bet, and it will trigger free spins. Once the feature triggers, you get a wheel spin which will tell you the number of spins. It can be anywhere between 3 and 25 free spins. Before each round begins, you will find that a wheel will spin on top of the reels and it will show you what kind of multiplier you get. It can be 10x, 5x, 3x or 2x. To get more free spins, you need 2 or more scattered symbols to be present. 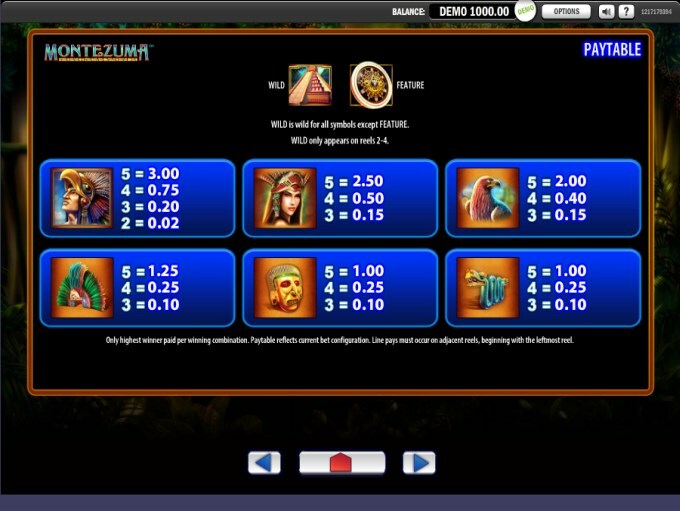 The new free spins will use the multiplier which was selected for the spin during which you got them. There is no option to use fewer than 30 coins, and that means that all the lines of the game are active each round. You can work with the coin denomination, between $0.01 and $2, so the largest wager possible is $60, while the smallest one is $0.30. The top prize is a very low number of 300 coins, with a maximum value of $600. The free spins can apply multipliers as high as 10x, so obviously it can be improved if you’re lucky. While the Aztec theme is hardly unusual, I have to say that I enjoyed playing on this one. The quality of the symbols that are themed is excellent, but unfortunately there are some that are not inspired by this civilization, being simple poker cards. The jungle is shown in the background image, a dark place that looks dangerous. The part that does most for this game would be the quality of the themed icons. Symbols: Temple (wild), Round Jewel (scatter, 10x the bet), Montezuma (300 coins),Princess (250 coins), Eagle (200 coins), Headband (125 coins), Gold Mask (100 coins), Gold Snake (100 coins), Ace (50 coins), King (50 coins), Queen (50 coins) and Jack (50 coins). The history inspired theme works well, there are big multipliers coming with the free spins, and I’ve enjoyed the design, but the top prize is disappointing enough to make me recommend you try another slot, at least if the money you win is more important to you than the gameplay experience. 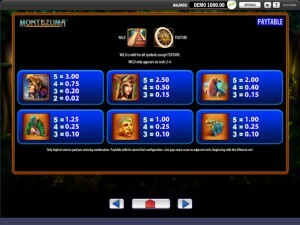 This Montezuma slot is offered by all online casinos with WMS software, playable either in practice or in real money mode.